Giant papillary conjunctivitis (GPC) is a condition where the inner surface of the eyelid becomes irritated. 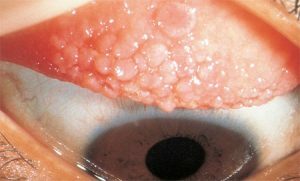 In GPC, large bumps (papillae) appear on the underside of the eyelid.? It is most commonly related to wearing contact lenses. GPC occurs both in patients who use soft and rigid gas-permeable contact lenses, though it occurs much more frequently in soft contact lens wearers. The condition can appear at any time, even after many years of wearing contact lenses with no problems. Rarely, people who are not contact lens wearers can get GPC, such as people who wear artificial eyes or who have exposed sutures (stitches) in their eye. If you wear contact lenses and have asthma, hay fever or other allergies, you may be more likely to get GPC. Normally, the underside of your eyelid is very smooth. In the early stages of GPC, this area of the eyelid becomes rough, red and swollen. Then bumps (called papillae) form and can grow larger than 1 millimeter (about the size of a pinhead) in diameter. Some people with GPC also notice that their contact lenses tend to ride up on their eyes when they blink, as though the lenses were sticking to their eyelid. If it is not taken care of, GPC can damage eye tissue and the cornea (the clear front window of the eye) as the large bumps underneath the eyelid rub against the eye. limiting the amount of time you wear your lenses each day. GPC can be an ongoing problem. If you notice symptoms of GP C returning, you should see your ophthalmologist (Eye M.D.) immediately. If GPC keeps coming back, your ophthalmologist may suggest that you not wear contact lenses at all. Your ophthalmologist will work with you to find the best way to treat GPC.